If Batman played golf, these would be his clubs. They simply look bad to the bone. Gunmetal. Are you serious? Is that AC/DC playing as I rip my four iron out of the bag and spit as I address my shot? Rock it, baby. Come on. On a serious note, I did not hit these any differently than some of the other clubs I have tried. I hit the Nike MachSpeeds farther. I was a little more accurate with the X22s. On a side note, those X22s make a run for the money in terms of "coolest looking golf club," too. Cleveland is no slouch, though, folks. 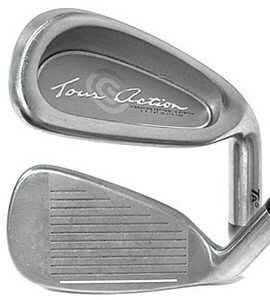 One of the coolest features of these irons is the True Temper "Sensicore" shaft. It actually has an inner rod that is somehow surrounded by foam to deaden vibration. This is a very good design. While I don't really "tire" with other clubs, these are supposed to cut fatigue drastically. These irons not only produce great looking shots, but they just flat out look tough. Of course, no one looks to coordinate their equipment based on appearance alone, but if you can hit these things -- they look pretty mean in your golf bag.